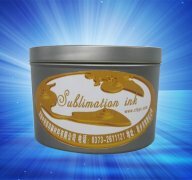 For our sublimation offset ink,first print image on paper,second put the paper on fabric,and then press the paper with transfer machine. Under the temperature about 190°C-220°C,the ink on paper will become gas and go into fabric.So the image will be from paper to fabric. * High transfer rate and safe for the environment and has no harm to skin. * Excellent color reproduction, gorgeous color, not color cast. High printing performance. All the colors are very intense. * Applicable to synthetic fabrics such as polyester fabric, smooth feel comfortable, no hard feeling. * Transferred pattern scratch-resistant, washable, non-cracking, no peeling, no fading, and good weather resistance. * Good stability on the machine, clear dot reproduction, excellent ink-water balance. Polyester fabric, Triacetate fabric, Nylon fabric,Acrylic fabric, Polypropylene nitrile. (1) Print the image on paper, and normal paper is ok.
(3)Put the paper and fabric on the heat-transfer machine. When the temperature reaches 180-220°C, the image will betransfer printed from paper onto the substrate.